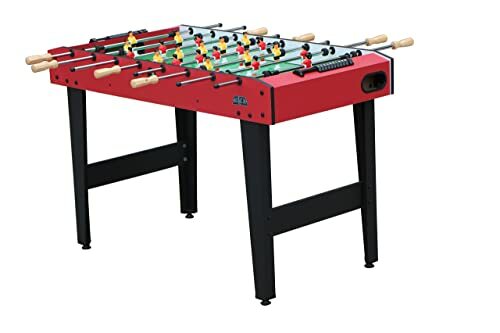 Full-size foosball tables take up a lot of space, so what are you to do if you live in a small apartment, condo, or home without that extra space? 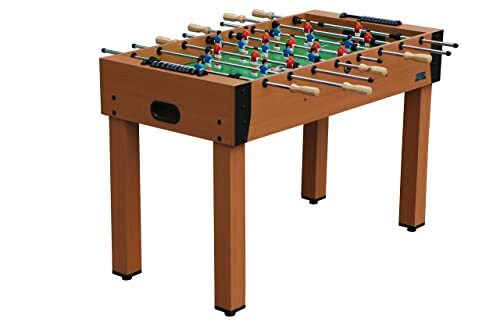 Why not try a small foosball table? 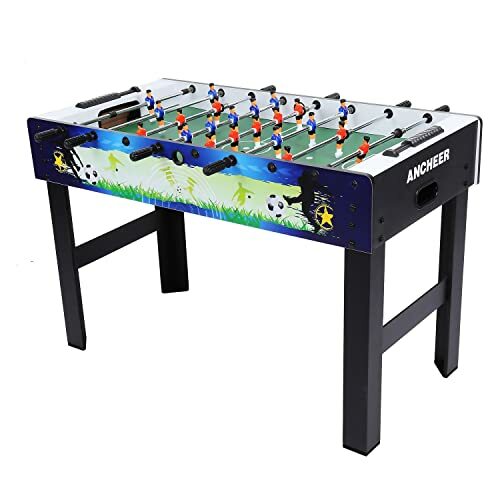 One of the 48-inch foosball tables makes the perfect addition to a home game room or living room when there’s not enough space for the full-size models. Plus, these smaller tables are great options for your teens and younger children since they tend to have a cheaper price than your full-size Tornado tables. 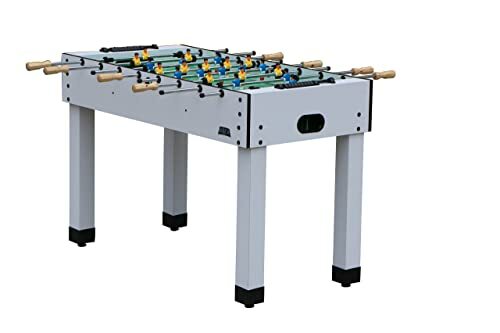 To show you what’s available on the market, we’ll share some of our favorite small foosball table models with you below. There are a lot of great home foosball tables out there, and we’ll discuss a few of those below. All of these tables are 48″ tables designed for kids and young adults. This is a heavier table than all of the others above due to the materials used (composite wood, stainless steel rods, etc.) which ensure a table that will last a very long time. This table has all of the hallmarks of an arcade foosball table and almost looks “too good” to be in a home game room. KICK is a well-known name in the foosball table industry for their quality and craftsmanship and this table is worthy of the KICK name. It’s natural wood finish blends in with most rooms and decors for at-home use in a game room. The KICK Glory is highly recommended and highly sought-after for it’s impeccable quality which is backed by a lifetime warranty. The second of four KICK tables here, this is the Elite model and it’s phenomenal! The table is done up in a striking red color which makes it stand tall in a crowded room. The attention to detail here is great with ABS-molded players in red and yellow. Stainless steel rods (a KICK mainstay on most of their models) are built to last for decades which sets this above other tables in its’ price point. Most other manufacturers use cheaper materials such as chrome-plated steel rods. As with other KICK tables, this table is a little bit heavier than your normal foosball table. The Elite will provide many years of gameplay and satisfaction and as with most KICK tables, it’s backed by a lifetime warranty. The Fantasy is a great table that brings foosball to life with quality materials and attention to detail that others miss. The table comes in a light grey color and is sturdily built with leg levelers to help with stability. Rubber grips and chrome-plated steel rods help with player control and fast play. The grey color of the table does make it stand out in a dark-colored room or a darkened arcade. Whether it’s home or business, the Fantasy is ready to play with many hours of fun waiting to be had. 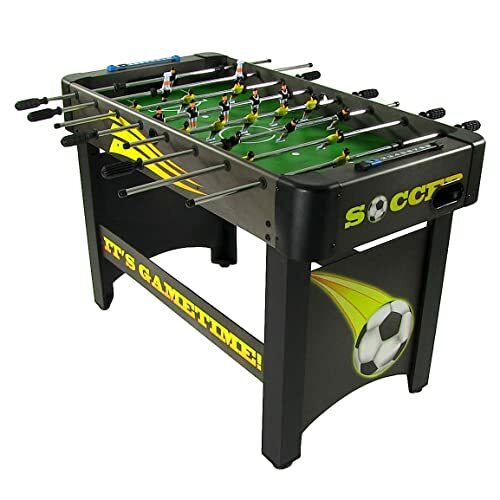 The Conquest is the top-of-the-line 48” entry from KICK, a maker of foosball tables since 1994. 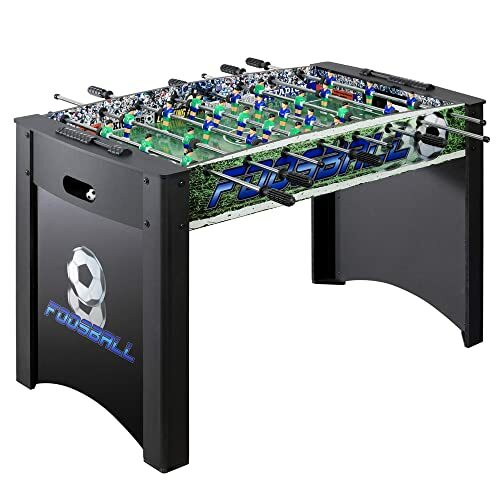 The table has all the features you would need in a competitive foosball table. There are no cup holders here as KICK focuses on quality gaming and quality components. A thick and sturdy gaming table with a Mahogany-type finish, supported and reinforced with crossbeam support. The players are made of ABS plastic and finished in stunning lifelike detail in red and blue. The rods are done in stainless steel for durability and long life with wooden handles on the ends for detailed play. The Conquest is a stunning table, both in looks and in gameplay. The mahogany color really makes the table stand out and is beautifully done. You can tell a lot of time was put into the design of this table. As with most other KICK models, this table comes backed with a lifetime warranty. The Best Choice is a sturdy table built to last out of composite wood. The steel rods are made of chrome-finished steel and are light to use and react well to gameplay. The rods also come with rubber grips on the end for precise control of the players. The attention to detail is nice with players painted in vivid detail with red and white uniforms. If you’re thirsty, there are two cup holders on each end of the table which is a nice addition to have on a table like this. 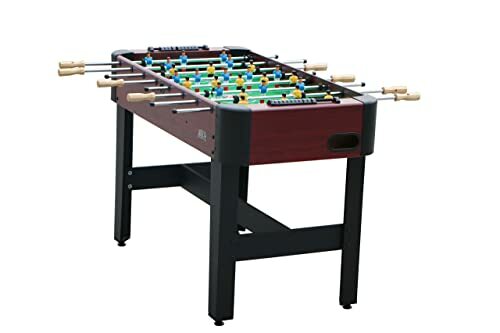 The Best Choice model is a great table that is well-built and has some attention to detail which enhances the Foosball experience. One thing that stands out with the Ancheer table is the color and the artwork on the sides. This alone makes the table stand out in a game room amongst other tables. This table is very sturdy with reinforced legs which are nutted to the main table. That keeps the table stable under heavy duress during game play. The table surface itself is made of medium density fiberboard which is an industry standard in quality tables. Game play is fast and easy with the chrome-plated rods and rubber grips. Players are detailed with red and blue uniforms and made out of high-quality ABS plastic. Scoring is tabulated on an abacus-like slider above each goal at the ends. The Ancheer is a quality-made table with beautiful artwork and lifelike players on the playing surface. One can get many years of gameplay out of this wonderful table. The Sunnydaze also has striking artwork on the sides and the ends. In bold yellow and black, this table looks to be the beacon of enjoyment in your game room. This table comes ready to go with a bright green life-like playing surface on medium density fiberboard. The yellow and black motif extend to the players on the field as well, done up in beautiful detail. The table also comes with floor levelers under each leg to ensure a level playing surface. You can keep score with the sliding display on each end of the table. The Sunnydaze really steals the show in any game room with the amazing artwork and fast gameplay. This table is highly recommended for hours of great fun. The amazing artwork on the Hathaway takes a different approach as it’s inside the table! Capturing the feel of a packed stadium, the inside artwork on this table really is top notch. Quality workmanship extends all the way around with ABS-molded players in lifelike detail. Chrome-plated steel rods and rubber grips enhance the experience and detailed nuanced play. Hours and hours of game play are assured on the well-built medium-density fiberboard playing surface. The Hathaway is a great purchase and would fit in well in any game room or fun environment. The home foosball market is as competitive as ever, but what does a good table entail? 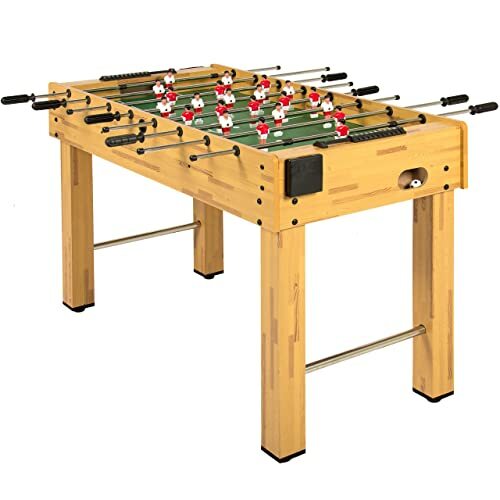 A good foosball table needs to be sturdy to withstand aggressive play and be built with quality materials for long-lasting life. You also have to consider the weight of the table and incidentals that may enhance the gaming experience. Also, you should consider the aesthetics of the table in relation to the environment that it’ll be in. Is the table for a home game room? Is the table going to be used for commercial purposes inside of an arcade? All of these questions go hand-in-hand when thinking about purchasing a table. The emphasis on quality materials cannot be overstated as the very essence of foosball requires manic gameplay from time to time. Nobody wants a table with rods that will break easily when spun too hard and slid around too much. Conversely, you don’t want to purchase a tank of a table that is too hard to set up for a home environment (if that’s where it’s going to be set up) either. You have to account for the home game room and where the table is going to be placed. There are going to be different needs and requirements which are factor-dependent on where the table will be used.